· Asbestos Analysis In Lung Tissue: We provide tissue analysis services to law firms throughout the United States. Detection limits typically are < 6,000 fibers/gram dry weight tissue - the best in the industry. Multiple analyses per case are typical when burden is low. Thirty years experience and over 1200 cases. Publications. · Documentation Of Nonfibrous Pneumoconiosis: We document tissue burdens of silica, silicates and toxic metals by the in situ method (tissue section mounted on a carbon disk) or by digestion/filtration analysis. Thirty years experience and over 1000 cases. Publications. · Other Issues: Diagnostic services using scanning electron microscopy/elemental analysis. Syracuse, NY is the clinical consultant to Meixa Tech. · Other SEM / EDS Applications: Slip and fall cases involving painted and skate-board waxed surfaces, paint transfer analysis, glass analysis, inorganic substance identification, metallurgical failure imaging and other issues. · Industrial Imaging And Analysis By Scanning Electron Microscopy - Elemental Analysis: We offer state-of-the-art imaging and elemental analysis that includes mapping with a thin-window EDS detector. · Industrial Imaging By Microscopy And Macro-Imaging: We offer high resolution imaging (2700x2100 pixels) with a Pixera 600CL digital camera. An extraordinarily high depth of field is possible with our optics/camera system. · Gunshot Residue Analysis & Firearms Analysis: Bryan Burnett has been active in gunshot residue research for twenty years and is a published authority on gunshot residue. He has numerous research papers in the field (Bryan's CV). Bryan has studied many aspects of gunshot residue (GSR). · Crime-Scene Reconstruction: Bryan Burnett is a court-qualified as crime-scene reconstruction expert and he has published reconstructions. Crime scenes are often quite complex and might require the expertise of more than one person to generate a reconstruction. · ETEC Scanning Electron Microscope: The ETEC Autoscan scanning electron microscope has been a workhorse of the industry for almost 3 decades. The ETEC operated by Meixa Tech was built in 1973 and purchased in 1989. Is such an old instrument reliable? Yes, indeed, the ETEC Autoscan is famous for its reliability! In addition, Meixa Tech owns complete sets of parts from five other ETECs. This means that we have multiple replacement parts for virtually every component of the ETEC. Downtime will usually be never more than a day. Chamber size is, however, a limiting factor for some clients in that movement in the X, Y and Z directions is not much more than 3 cms. However, fairly large objects may be put in the chamber as long as the area of interest can be positioned in the central area of the chamber. Call for further details. · IXRF Systems EDS2000 Microanalysis Systems: The IXRF Systems EDS2000 was purchased in August 2001. The system is interfaced with the ETEC Autoscan by a Kevex 4850S interface module. The EDS2000 is capable of imaging to a resolution of 2000 x 2000 pixels, elemental analysis through a Kevex Quantum thin-window detector, and elemental mapping is available. · Vacuum Evaporator: Both carbon and metal coating are available. · Nikon Labophotpol Compound Microscope: A high quality microscope with polarizing and imaging capabilities. · Bausch & Lomb Stereo7 Stereomicroscope: A high quality stereomicroscope with imaging capabilities. Scientific Digital Camera: This system can achieve an extraordinary depth of field, which greatly exceeds the depth of field of obtainable by film back cameras and matches or exceeds that of the scanning electron microscope. 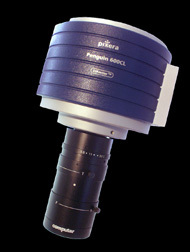 · Pixera 600CL Digital Camera: Meixa Tech uses the Pixera 600CL for virtually all imaging with the compound and stereo microscopes as well as macro imaging. The 600CL is capable of obtaining 2700 x 2100 pixel resolution, which provides images that are close to the resolution of a film-back camera. The CCD of the 600CL is cooled thus allowing for a truly remarkable sensitivity.